MIXMANCER now available via Comixology! For those who missed out on the Kickstarter, MIXMANCER is now on sale at Comixology for the low-low price of $1.99. Get on the mashup comic of the year by clicking here. As we get closer to hitting our funding goal for Mixmancer, I’ve started putting together all my scripts for the “Script Selector” reward level. This will feature the script for Mixmancer, as well as at least 7 others that I’ve written over the last 7 years. I just finished reformatting one from 2008, and it gave me quite a laugh. Chris Lewis ca. 2008 was waaaay into hitting the return key to get to the next page of the document. He also like using captions. A lot. I decided to reformat it to make it look (and read) like my current scripts, but I haven’t changed any dialogue or panel descriptions in order to make it look like I knew what I was doing back then. Because, really, I didn’t. The story, Little Earth People, was the first miniseries I wrote. A slightly altered version also saw the light of day in 2009 as part of DC’s Zuda competition. Check out that Joe Pekar art! It would take hundreds of more hours at the computer before I would get to the point of being able to write something like Mixmancer, or my book Drones that is coming out in April via IDW and Comics Experience. Sometime in the intervening years I also figured out how to add page breaks. In addition to LEP, you’ll see my script for the Intro To Comics Writing course from Comics Experience. That will take us to some Azkaban fan fiction that was also developed as part of the Comics Experience Creators Workshop (and which still cracks me up). Then it’s time for the first issue of Drones, the short story I contributed to the psychedelic Imaginary Drugs anthology (IDW), and two current projects I’m incredibly proud of. Looking at these scripts, I realize they tell the story of my development as a writer. Sharing and remixing stories is at the heart of Mixmancer, and I’m excited to share this one with you. I’m in love with this hip-hop hipster chick. So glad he went with her rather than the dude he originally planned on drawing. We’ve got more MIXMANCER pinups available at all reward levels $5 and higher. You can check ‘em out here. Thanks! …just hire Yannick Fortin, graphic designer and Canadian extraordinaire! Yannick, je te présente Chris, un très bon ami à moi et un auteur qui n’en est pas à son premier comic. Il a besoin d’un logo pour son comic MIXMANCER, une histoire assez pétée de DJ cosmique qui peut remixer des hsitoires pour changer le monde. Pense rave+ psychédélique + métaphysique. Such a 70s piece of funky fresh pop – It was love at first sight. And that’s the version we ultimately ended up going with. You can check out Yannick’s logo and the final cover over on the MIXMANCER Kickstarter page. Creating a good logo is tough work – especially when your briefing is in French. So if you find yourself in need of a graphic design genius, a guy who can morph one idea into two equally attractive logos, give Yannick Fortin a ring. Examples of Yannick’s work, as well as his contact information, can be found here. We are live, ladies and gentlemen. It’s been a long time coming, but the MIXMANCER Kickstarter is finally here! So here we are. It’s going to be a fun 30 days as we try to raise $1k for our little hip-hop sci-fi comic book mashup. This is a book that couldn’t be done at a traditional publisher, and in order to spread our devious meme we’re relying on the largess of complete strangers with incredibly good taste. People like you! And just as the book features various pieces of pop-culture spilling out of its innards, so too does the campaign have something for everybody. We’ve got a digital version of the book for just $2, as well as remixed interior pages, print copies, defaced works of art, talking pinups, and superstar commissions. This is the jam! We do realize, however, that one person’s favorite tune can annoy the hell out of other people. If this doesn’t sound like your kind of thing, no problem. But maybe somebody in your social circle would totally be down with a Kool Keith / Swamp Thing-inspired one-shot. Every mention or share on social media can help us reach those potential readers, and we’re grateful for all the help we can get. That’s what MIXMANCER is all about. If you’re interested in the underlying pattern, please check out our subtly different story over on the campaign page. MIXMANCER – a 24-page hip-hop sci-fi one-shot, influenced by your favorite pieces of trivial pop-culture! Written by Chris Lewis. Art by Carlos Trigo. Colors by Andrew Crossley. Letters by Nic Shaw. Edits by Yannick Morin. In my last update I talked about the main digital rewards on offer in our Kickstarter, and today I’m going to drop the details on some funky remixes. Let’s get it on! I’ll send you a physical copy of the book, remixed with the help of wite-out, glued-on pictures, cut-out ransom note letters, and probably gobs of glitter. Includes the EXTENDED MIX and SCRIPT SELECTOR PDFs. This is going to be BIG fun! And time consuming. Actually, I’m quite scared about this reward level, as I’m sure I’ll want to spend way more time on these than I possibly have. But the Mix is strong in me, and I’ve already got some ideas for themes and visuals that are going to make these things pop. I’m also open to requests, so if you are dying to see your favorite Hollywood actress duke it out with an Italian soccer star, I will make that happen! 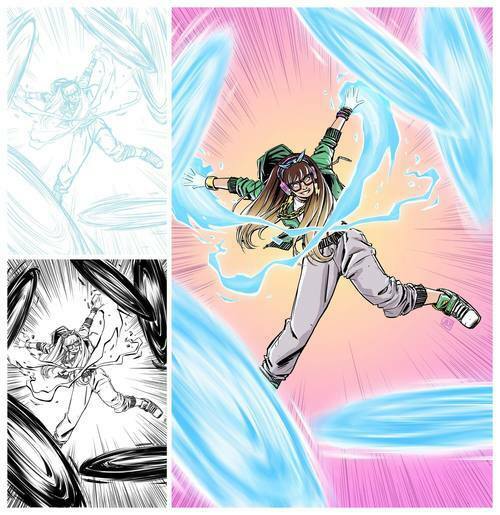 A guest artist will re-imagine one of the interior pages and send you the original art. Includes the EXTENDED MIX and SCRIPT SELECTOR PDFs. I’ve got a bunch of highly talented artists ready to reinterpret every page of the script. Help get some money in their pockets, and you’ll be the proud owner of a brand new page of original artwork. And now we’ve come to my big dream. If we can get 24 backers at this level, I’ll get all the pages colored, have Nic Shaw drop some new letters down, and put together a digital remix version of the book for EVERY SINGLE BACKER! It’s Mixmancer Redux, baby! January 19th. The Mix is on. MIXMANCER – a 24-page hip-hop sci-fi one-shot with more hyphens than you can shake a stick at! Written by Chris Lewis. Art by Carlos Trigo. Colors by Andrew Crossley. Letters by Nic Shaw. Edits by Yannick Morin. I announced the upcoming Kickstarter a little while ago, and now it’s time to talk about the entry level digital rewards. These are the levels that are going to scratch that comic itch. They are also the backbone of the entire campaign, and we couldn’t be more excited to share them with you. 24 pages of Mixmancer madness in a DRM-free PDF. This is the entry-level, DRM-free PDF for those who are just interested in the killer cover and 24 pages of madcap action. For just $2, you’ll get the book and access to exclusive backer updates. Keep the party going after the 24 pages are over. This PDF includes the story, script, back matter, sketches, pinups, and playlist. If you want to find out just what went into the making of this Frankenstein monster of a book, this is the reward level for you! I’ll be including the original character designs by Carlos, all the juicy pinups, as well as a playlist that highlights all the pop-culture snippets I cribbed. Why settle for one file when you can get two? This includes the EXTENDED MIX as well as a PDF featuring scripts from my other projects. In one of the more blatant samples (ie. rip-offs, of which there are many) of Ryan K Lindsay’s brilliant Kickstarter campaign for Deer Editor, this reward level includes a PDF full of scripts from my other projects, including RETURN TO MAKER (my short story in the Imaginary Drugs anthology by IDW), the upcoming construction worker vs. mutant caterpillar miniseries MITCH HAMMER, another new project called KARMA POLICE, DRONES, my Zuda story LITTLE EARTH PEOPLE, awesome fan fic, my first script from the Intro to Writing course at Comics Experience, and more! The older scripts might be a bit rough around the edges, but I’m still proud of ‘em and hope you’ll enjoy seeing my progression over the years. I’ll drop some wisdom in the form of a word balloon or caption on the pinup of your choice, and send you the digital file. Includes the EXTENDED MIX and SCRIPT SELECTOR PDFs. Some amazing artists have stepped up to make the Mixmancer block party even louder. At this reward level, I’ll do a little emceeing over their beats. The result? A personalized, digital pinup with somebody’s words in one of Nic Shaw’s balloons – all for you. This last one might get a bit sassy! Tomorrow I’m going to reveal the remix levels, pinup artists, and the chance to create a whole new Mixmancer comic. This, my friends, is where it’s at. Hip-Hop meets Sci-Fi in the greatest mashup since The Grey Album! Written by Chris Lewis. Art by Carlos Trigo. Colors by Andrew Crossley. Letters by Nic Shaw. Edits by Yannick Morin. MIXMANCER is a 24-page one-shot about a superhero DJ who hunts down a memoir-gone-wrong to a local bookstore. There, he must remix pop-culture in order to fight an extra-dimensional thought-virus, spiky pink tentacles, and self-help fundamentalists! We are bringing MIXMANCER to Kickstarter because, frankly, there is no better way to distribute a book that has been described (by no one) as a Swamp Thing / Kurt Vonnegut lovechild. For only $2 you can witness the birth of a new pop-culture avatar, humanity’s last hope in its battle against cultural stagnation and the same old story you’ve heard a million times before. The campaign will launch on January 19th, so please help spread the word. The more backers we have at the beginning, the higher our visibility will be on Kickstarter. This will obviously increase the chances that other readers will make their way to the Mixmancer mashup. As we approach the launch date, I’ll be posting more information about the various reward levels here and at mixmancer.tumblr.com, as well as sneak peeks of the artwork. Speaking of, here’s a look at Tony Gregori and Jasen Smith’s lovely MIXMANCER pinup. Smack it up. Flip it. Rub it down. Oh no! It’s been a wild few months. The Drones Kickstarter was successful and we’re now in the fulfillment phase. The amazing Carlos Trigo and I are almost finished with a 24-page one shot entitled Mixmancer. I’m also developing four other projects with artists whose work I’ve drooled over in many public places. I’m also overjoyed to be heading to the wonderful Thought Bubble next week! I visited this show last year and was blown away by the atmosphere and dedicated fans. This year I’m exhibiting, and it will be the first time that the Drones tpb will be available to the public. If you’re going to attend, come by New Dock Hall, table #46, and say hello. I’ll also have some beautiful A3 prints, and there might even be some freebies for the first people to swing by.